Welcome to My Thai Cooking’s Private Thai Cooking Classes in Bangkok. Our private cooking classes represents a culinary and cultural Thai experience that features flexible scheduling and menu choices based upon your preferences. You can select 4 dishes freely from our large menu of Thai courses that includes popular dishes from Royal Thai cuisine as well as snack, desserts and street food favorites. If you wish we will also bring you on a tour of an authentic Thai fresh food market or an organic fresh food outlet before the food preparation and cooking starts. 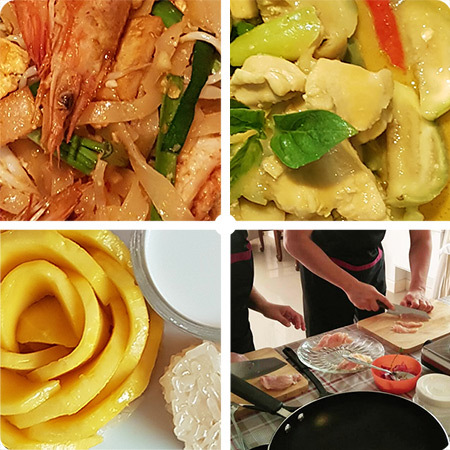 If you’re looking for a fun and unique way to enjoy your time in Bangkok together with friends, family, or co-workers our private cooking classes are the perfect choice. Our large menu includes all time favorites like Tom Yam Goong, Pad Thai, Som Tam, Massaman Curry, Green Curry, Khao Pad, Nam Tok, Larb, Pad Kra Pao, Red Curry and many more. If you have some particular favorite dish you don’t see in our Thai dishes selection, please contact us to inquire if it can be included. Price: 2.500 THB (79 USD / 70 EUR) Per person. Use our online booking system to check availability and select wanted class start time or if you prefer contact us via email, phone, Messenger or WhatsApp. *Upon receiving your online booking we will contact you to confirm and setup class schedule and selection of dishes according to your preferences. We provide a complimentary pick-up service at Bearing BTS Station which is located on Sukhumvit Road in the Bang Na area of Bangkok. The Bangkok Sky Train System (BTS) provides a fast and easy way of travel around Bangkok, view the BTS Station Map to find your closest BTS or MRT station.